When fruit is visible on the tree it is simple to identify a plum tree. In the absence of fruit it is not so simple. At a glance, other fruiting trees can look very similar and the only way to tell them apart is through subtle differences. Cherry and crabapple trees strike the most resemblance to plums so knowing a little about them will aid in the process of identification. There are two distinct kinds of plum trees. Fruiting plums bear the edible fruit you find at the grocery store. The non-fruiting or ornamental plum trees are referred to as flowering plums. The flowering type may develop small edible hard fruit but it is only of interest to the birds. Flowering plums have been bred for their colorful foliage and attractive flowers. Most of the fruiting plums have a common rounded crown and are a medium sized tree. 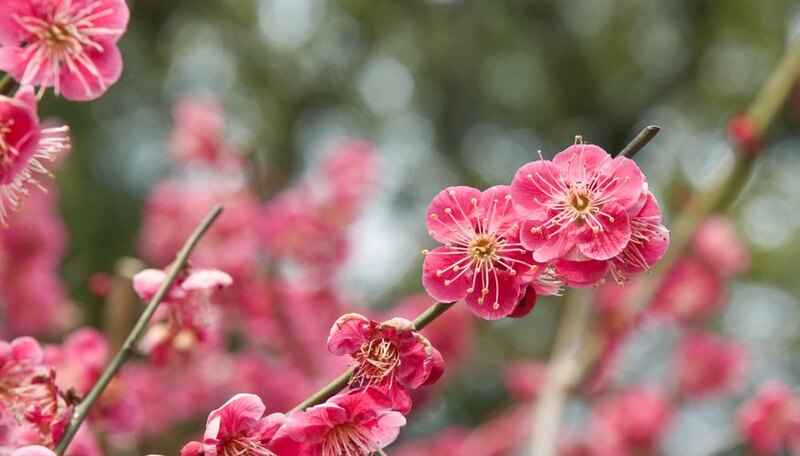 The flowering plum varieties may come in weeping, horizontally branched and dwarf forms. Plum leaves are oblong in shape with a pointed tip. The leaves are surrounded by serration similar to what is found on a knife. Species plums have green leaves but many of the hybrid varieties will have red to purple leaves. 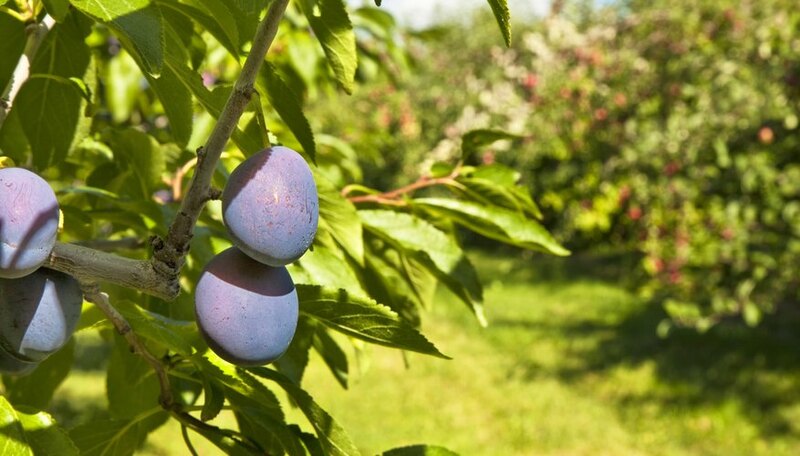 The purple leafed plums are the ornamental type which carry their deep leaf color throughout the season. The colorful leaves are the strongest reason to plant a flowering plum. Some of the most popular dark leaved plums are variations of Prunus cerasifera. Common varieties are Thundercloud, Pissardi and Newport. There are two types of edible plums. The European variety is the most common in temperate weather regions. Like many fruit trees, this plum is very hardy and needs a winter chill period to fruit well. This group includes the Italian Prune Plum and the Damson Plum. The other fruiting type is the Japanese plum. Examples of Japanese plums are the Santa Rosa and Satsuma varieties. 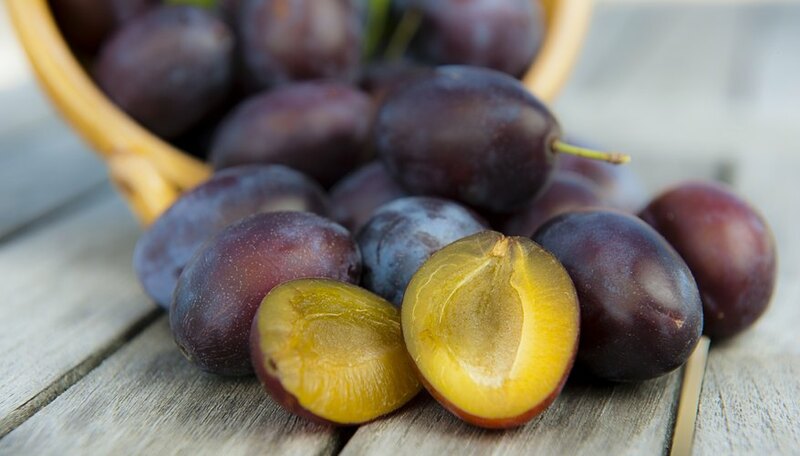 Plums may be yellow, red or purple and the fruit comes in different sizes from 1 inch to around 5 inches. European plums ripen late in the season and Japanese plums are earlier. Plum bark tends to be dark, smooth and unimpressive. Older plum trees will have slightly rougher bark but nothing ornamental enough to mention. This is one way to tell a plum from a cherry or crabapple. Cherry bark has obvious horizontal lenticels or lines on the bark that go around the trunk. Crabapples develop plated bark that looks like rough squares up and down the trunk. Fruiting plums are in the rosaceae family, which have simple five petaled flowers. The ornamental plums are bred to have single or double white or pink flowers. Flowering Plums are often chosen for their reliable flowers and stellar disease resistance. 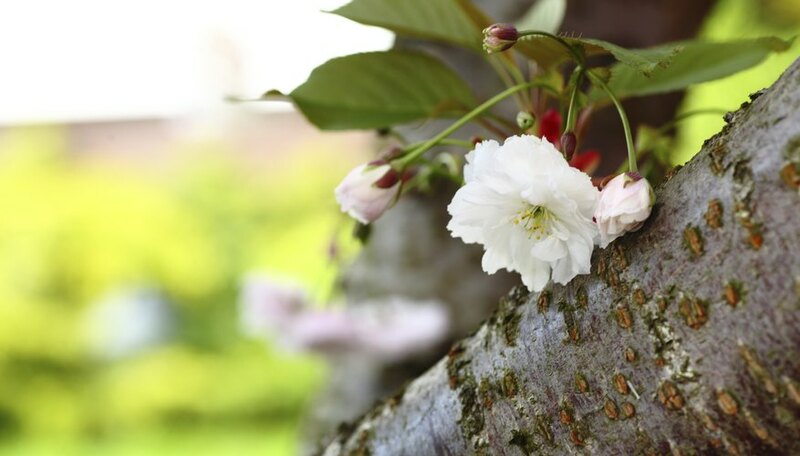 The Double Flowering Plum, Prunus triloba is a good example of this. This plum is a multistemmed shrub no taller than 12 feet at maturity. When in bloom, Prunus triloba will be completely covered with double pink flowers. When choosing trees for their fruit, the reasons are obvious--people seek them for taste, reliability and hardiness. When choosing between ornamental plums, crabs and cherries, there are some differences to note. Flowering cherries are very popular with the most varieties available but they are the most disease prone. Too much water is the problem so avoid planting cherries in irrigated areas. 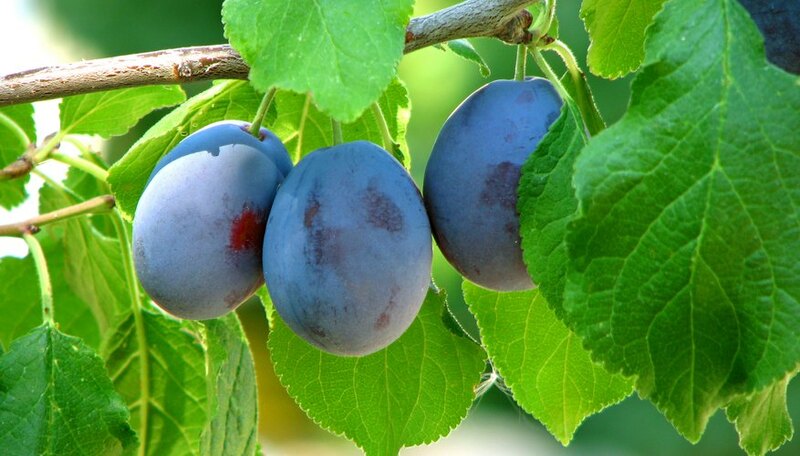 Plums have only one bad habit--they tend to sucker, so plant them in turf areas where the mower can control them. Crabapples have no cultural issues but produce more fruit, which can be attractive but may create more clean up. 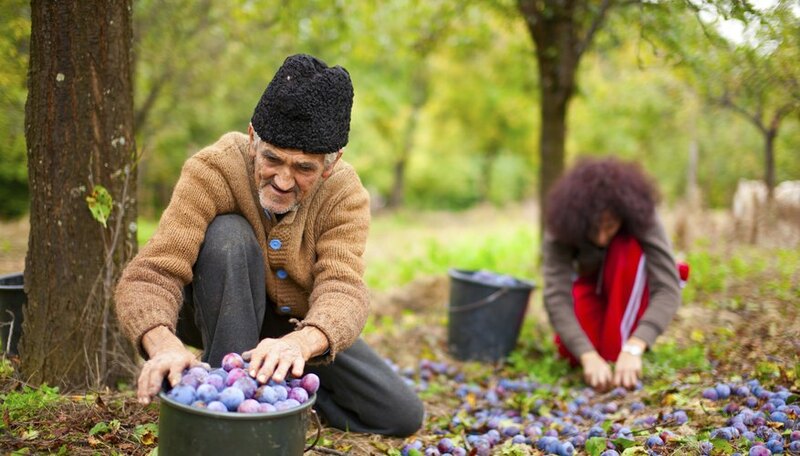 Plums, with their limited varieties, are possibly the most carefree of the three trees.